The formation and evolution of the ocean crust is a fundamental Earth process, yet long standing scientific questions remain unanswered, principally due to the limited sampling of the lower crust and upper mantle from the ocean basins. 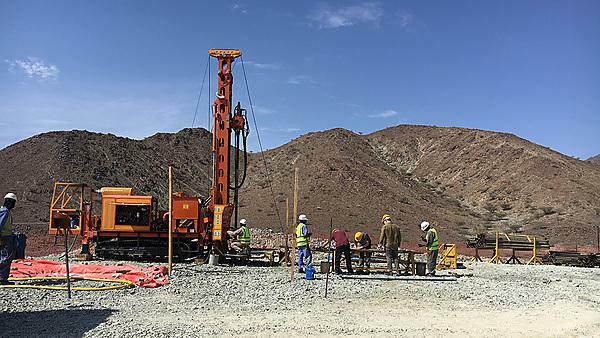 The Oman drilling project represents an opportunity to study the exposed ocean crust in Oman in unrivalled detail by combining the detailed core logging typical of scientific ocean drilling with outcrop observations. Over two winter drilling seasons, a series of boreholes will be drilled that sample different levels of the lower oceanic crust and shallow mantle. During the first drilling season (December 2016 – March 2017), Plymouth University staff Dr Michelle Harris and Professor Antony Morris along with PhD student Louise Koornneef were part of the international onsite science team where 4 boreholes were successfully drilled. Holes GT1, GT2 and GT3 each recovered a 400 m interval through the lower crust. Hole BT1 recovered a 300 m interval through the basal thrust of the Oman ophiolite. All of these cores will be the focus of a 2 month core logging campaign (July – September 2017) aboard the drilling vessel Chikyu where the cores will be logged and sampled for future studies. Dr Michelle Harris has been invited to be Co-Chief Scientist for part of this campaign and will be Co-Chief for Hole GT3. For future updates on the project please follow @OmanDrillProj and @michelleharri5 on Twitter.